Picking them up and laying them down: After the marathon - what next? After the marathon - what next? Since the London Marathon, I've been lacking a goal. For the marathon I'd followed a relatively strict schedule, the Pfitzinger 55 mile plan, for four months. On the day, maybe because it was warm, maybe because I'd gone too hard in a 10k the weekend before, I didn't run as I felt that I could. That said, my fade at the end of the marathon probably only cost me about 5 minutes all in. But I was disappointed. So, in the immediate aftermath of the race, it was tempting to just sign up for a fall marathon - like Loch Ness - and start a new training cycle. But fall's a long way off. I am away a lot this summer with various teaching and family things, so my training might be difficult to fit in. But that's just and excuse: my real problem is that I could dedicate myself to marathon training for five more months, and maybe cut off five minutes from my London time, but so what? Prior to the marathon I'd signed up for a nearby sprint triathlon. So, this has been my proximal focus. My problem with triathlon isn't running (obviously), and not swimming (which I enjoy as a complement to running). It's biking. And I like biking. I just don't have a social structure that reinforces it. I ride on my own, and it is fine. 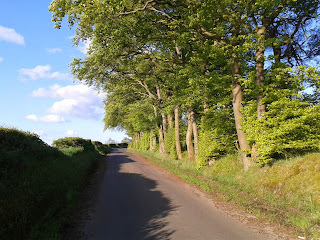 On warm spring evenings after work, with the light on the trees, it's actually fairly good. I like poking around on roads that I haven't explored, out in the countryside. But I haven't quite committed to cycling. I dabble. And I think I need to do more if I'm going to do more in triathlon. I wanted to get another ride in on Sunday, but was out all afternoon. Maybe I'll try to ride tomorrow.